Retirement: often lauded as a time to enjoy what we have worked for all our lives, taking trips, cultivating hobbies, and being with friends and family. Many use their freedom for kicking back and pampering, while others take advantage of the extra time to engage in transformational contemplative work. It can be a time of great joy and pleasure, but it’s not always smooth sailing; it can also be a time of great loss, whether of career, health, or loved ones, and often concurrently. It is in these desperate times that our capacity for transformation is greatest, and that’s where retreats come in. Read our collection of testimonials below to see how the majority of our community is taking life’s beatings and turning them into gifts. 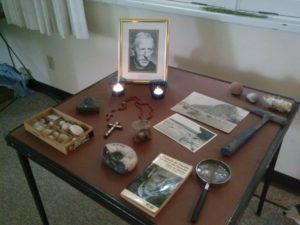 The five-night Gospel of Thomas retreat allowed us to go more deeply into contemplative silence and the contemplative mind. Matthew provided the perfect balance of silence, practice, and teaching. Practice consisted of mindfully working in the garden while attempting to pay attention to the movement of our thoughts, emotions, and bodies as we worked with others and worked alone. In the physical movement of raking leaves, sweeping the sidewalk, or pulling weeds, one has the opportunity to practice maintaining contact with one’s body, noticing reactions to the work itself as well as to those working nearby. This spiritual lab is an excellent opportunity to experiment and offers skills which are applicable to life beyond retreat…I continue to be grateful for the presence and work of TCS on Vancouver Island and beyond. Many thanks for providing this opportunity as well as the financial support provided. The combined wisdom of 21 people plus Matthew’s teaching was absolutely extraordinary. This created a very intense time of learning for me. The work group periods turned out to be the most challenging part of the retreat for me, as there was someone in my work group who really pushed my buttons. For various reasons I developed a real resistance to this person, so I knew this was where the work for me was at this retreat. I am extremely grateful to those who have supported The Contemplative Society community by funding scholarships, and to those responsible on the board of The Contemplative Society for awarding the financial assistance. It was very much appreciated and I almost certainly would not have come to the retreat without that help. I believe retreat scholarships are very important to The Contemplative Society and give life and growth to it and the world through them. I sincerely appreciate the generosity of The Contemplative Society for awarding me with a scholarship to attend this retreat. I wanted to go to a retreat but I am on a fixed income and couldn’t afford registration so I ate humble pie and applied for a scholarship. I was delighted to receive it and am so thankful for it! When Mirabai read the beautiful piece on page 33 from her book Mother of God, I had a spiritual awakening. The words of the new Pentecost spoke to my heart. I felt a releasing and a letting go of my tight grip on life. It was the beginning of a transformed relationship with the feminine Divine. My devotion was to Jesus, the Christ but now I also rest in the safe haven of Mother God. Now at home, in the morning I light a candle, sit, and meditate. I have wanted to use this for a long time but rarely found the discipline. It is with gratitude I now enjoy a morning sit. I attribute this to receiving the scholarship that allowed me to attend the retreat. Her authentic nature enabled me to assimilate new truths and already known spiritual practices into developing new, dynamic ways of viewing my spiritual practice. Sitting in stillness, as we did daily, was wonderful, especially in such a peaceful, sacred place. Mirabai’s talks were enlightening, especially the ones about the Christian mystics, pushing me further to reflect and study their time-honoured truths. At the end of the retreat we were asked to think about what we would be taking with us, what we have been called to do in the world. I was convicted to continue to write more poetry about the bleeding earth, a call to social justice, and increased consciousness of the world’s environmental problems. Finally, I would like to say that I felt very privileged to attend this retreat and to participate with other like-minded women. I am so grateful for the scholarship and will treasure the insights that attending this retreat have given me. I experienced the first dream visitation from my Dad since he passed away. 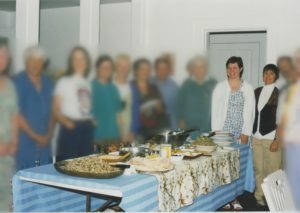 I feel sure that our Wisdom School’s daily extended time in group meditative prayer was the vehicle which provided a “thin place” where such a blessed connection could occur. Another particularly memorable moment occurred during a longer period of chanting on the final evening of the Wisdom School. Standing and using simple gestures to accompany our words, we sang as one body. I sensed a tapestry of spiritual community – though composed of many different strands – which awakened again in me the desire for deeper faith community. That experience resulted directly in a decision to align myself with a soul-nourishing worshiping community on a weekly basis as often as possible, even though it means travel beyond my local sphere and requires significant time expended to do so. I am thus committed to further study, to continue exploring intentional community, and to worship where my soul is fed. My heart is filled with gratitude for The Contemplative Society scholarship which made possible my attendance. My prayerful hope is that my experience will give rise to offering – in some way – a deeper blessing to the world. Retreats offer people on the contemplative path an opportunity to reconnect with the Mystery, strengthen our capacity to let go, and learn to live from love. But the burdens of the retirement stage of life we hope to transform are often compounded by financial constraints. That’s why we started the Margaret Haines Scholarship Fund, to help alleviate this one burden so that the rest may be freed. So if these messages touched you and you want to increase the world’s capacity for transformation, please consider giving to our new Margaret Haines Scholarship.